This is the first in a series that will spotlight The Atomic Grog’s picks of the top “modern retro” features at the world’s top tourist mecca. Disney World is a vast ocean of fun and frolic for all ages, but it’s easy to overlook the classic, timeless elements that make the massive resort special. It can be enjoyed on many levels – from the totally immersive, escapist experience in the theme parks to the many unique restaurants, bars and hotels. But what makes the fantasy complete is the incredible innovation, artistry and attention to detail that spans more than 40 years. The Atomic Grog is dedicated to celebrating and preserving cool mid-century kitsch, and there’s much of this to admire and embrace in “the happiest place on earth.” Is Disney World hip? Hardly. But it can still be enjoyed by geeky hipsters (and hipster geeks) with not a shred of irony. We hope you enjoy the ride with us. José, Fritz, Michael and Pierre perform on an elaborate bird-mobile that descends from the ceiling (November 2011). Location: Adventureland in the Magic Kingdom theme park. What is it? An indoor attraction themed to a Polynesian paradise featuring a colorful menagerie of flowers, Tikis and 200 performing Audio-Animatronic birds. 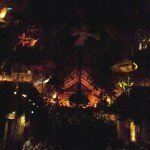 Origins: An opening-day attraction On Oct. 1, 1971, the Enchanted Tiki Room was originally known as Tropical Serenade. It was re-imagined and re-opened in 2011 under its current name with a show that pays tribute to the original Enchanted Tiki Room in Disneyland. Claim to fame: The Disneyland attraction was the first to feature the Disney invention of Audio-Animatronics and was reportedly Walt Disney’s favorite. Disneyland’s Enchanted Tiki Room, which still operates virtually unchanged since 1963, was a landmark in theme park attractions. Walt Disney’s creative team of Imagineers had produced moving figures, but none could talk and sing like those in the Tiki Room. 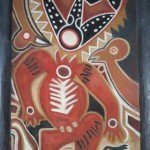 The birds, flowers and Tikis contained coils that triggered them to move after receiving signals recorded onto magnetic tape. 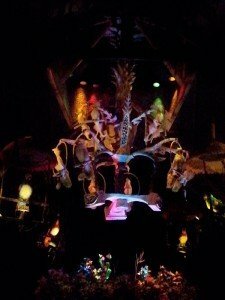 Audio-Animatronics would later be used in nearly all major Disney attractions, including The Haunted Mansion, Pirates of the Caribbean, and many more. 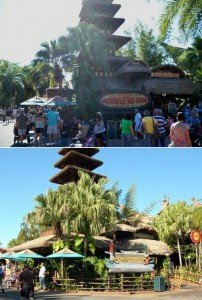 The Enchanted Tiki Room's Under New Management theming (bottom photo, February 2009) was ditched in 2011 when the attraction was returned to its original splendor and re-opened as Walt Disney World's Enchanted Tiki Room (top photo, October 2011). Disneyland’s Enchanted Tiki Room took shape very quickly after the idea was hatched. Seeking a storyline and a catchy theme song, Walt Disney summoned his young songwriting team, the Sherman Brothers, to an early demo of the first animatronics show. The brothers – who went on to become one of the most prolific writers of movie scores (Mary Poppins, Chitty Chitty Bang Bang, The Jungle Book) – had no idea what they were seeing. Richard M. Sherman recalled the duo’s first theme park song in a 2008 interview on the WDW Radio podcast: “We didn’t know what the devil it was,” he said. “We’d never seen anything like it before. It was weird.” Walt asked them to write a song that explained what the attraction was all about. So they suggested that the stars of the show be parrots, which would allow for better dialogue and lyrics. Without missing a beat, Walt immediately came up with the idea of four macaws representing different cultures, Sherman remembers. Walt wanted to start the show with a song. Since it was a tropical show, the Shermans thought it needed a tropical rhythm, like a calypso. For the hook, they started playing around with the word Tiki since it “sounds kind of cool,” Sherman said. They pitched the infectious line – “In the “Tiki, Tiki, Tiki, Tiki, Tiki Room” – and Walt loved it. He needed the song fast, so he rushed the boys out the door to write it, Sherman remembers. “And it’s now one of the longest-running show songs that’s ever been performed. 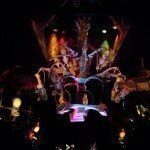 The birth of it was simply a need to explain what the Tiki Room was all about.” The Tiki, Tiki, Tiki Room was the first song written for an Audio-Animatronic attraction. The Sherman Brothers soon after wrote the popular theme songs to the It’s a Small World and Carousel of Progress attractions in addition to their film and stage work. The Enchanted Tiki Room show stars four charismatic macaws – José, Fritz, Michael and Pierre – who have their own distinctive personalities (and accents). The birds take guests on a magical musical journey that features hundreds of singing birds, serenading flowers, and chanting Tikis. The show concludes with a thunderstorm rocking the hut’s walls amid all the revelry. The toucans Claude and Clyde serenade their guests (October 2011). When Walt Disney World’s Magic Kingdom opened in 1971, a version of Disneyland’s Enchanted Tiki Room opened under the name Tropical Serenade. It was very similar to the Disneyland show but with a new wrap-around queue that surrounded a pre-show. 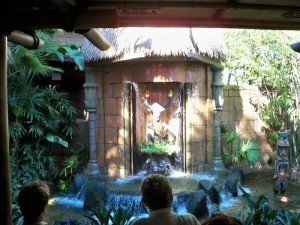 Instead of Tiki gods around a courtyard, the pre-show focused on two toucans who emerged from behind a waterfall to entertain the waiting guests. 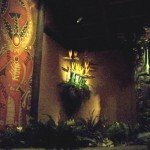 After 26 years, the original Disney World show was closed in September 1997 and replaced in April 1998 by the ill-advised Enchanted Tiki Room: Under New Management. The new animatronic hosts were Iago from Aladdin and Zazu from The Lion King. The voice of Gilbert Gottfried (Iago) was a jarring accompaniment to the sweet-singing birds, and the revamped Tiki Room alienated many purists. 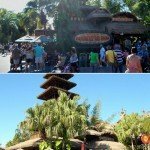 The Tiki gods finally got their revenge on Jan. 12, 2011, when the attraction caught fire. No guests or Disney cast members were injured but the blaze did significant damage to the attraction. 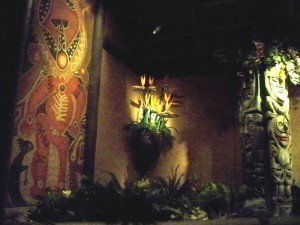 After closing for seven months, Walt Disney’s Enchanted Tiki Room reopened on Aug. 15, 2011, with a retooled show inspired by both the California version and the original Tropical Serenade show. The new performance is a shortened version of the current Disneyland show, which itself is a shortened version of the original. But the retro upgrade also ushered in new sound and lighting technology. The pre-show is back to its original form, with the toucans Claude and Clyde greeting guests. The main show still kicks off with The Tiki, Tiki, Tiki Room, but Iago is thankfully no longer around to interrupt. The Enchanted Tiki Room's roof features Asian water buffalo that appear to be Western longhorn if viewed from the rear in neighboring Frontierland (November 2011). * The Tikis in and around the showroom are based on the mythological Tiki gods of Polynesia – particularly Hawaii, Fiji, Tonga, and the Cook Islands. * The macaws’ plumage matches their accents: José (Mexican) is red, white and green; Michael (Irish) is white and green; Pierre (French) is blue, white and red; and Fritz (German) is red, black and white. * The giant roof is visible from nearby Frontierland, posing a problem for the Imagineers who pride themselves on creating a completely authentic experience in each themed land. An Asian water buffalo was chosen to adorn the rooftop so if viewed from Frontierland it would appear to be a Western longhorn. 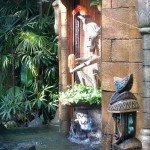 * The Tikis outside the attraction that shoot water on passersby were originally passive wooden figures designed by legendary Imagineer Marc Davis. 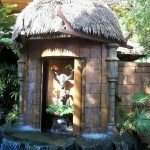 When they started to deteriorate, they were replaced with fiberglass replicas that were enhanced with water and steam effects, adding an interactive element to Adventureland. 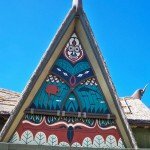 * In the early days of Disneyland, Walt Disney originally envisioned the Enchanted Tiki Room as a Polynesian restaurant with animated talking and singing birds. He was so impressed with the animatronics the Imagineers came up with, he ditched the dinner show and turned it into a full-fledged attraction. But we can’t help daydreaming about sipping a Mai Tai while watching the show. A view of the artwork as you enter the showroom (November 2011). * It’s one of only two attractions at Disney World that Walt Disney personally helped shape (that’s why his name is in the attraction’s title). The other is Walt Disney’s Carousel of Progress. * The Enchanted Tiki Room was a major influence on the latest generation of Disney artists such as Shag, Kevin Kidney, and Jody Daily. * While waiting for the pre-show to begin, listen closely for the classic exotica and Hawaiian tunes playing in the background. * The show inexplicably ends with Heigh-Ho from Snow White and the Seven Dwarfs, reminding us of our childhood and the Ramones (“Hey! Ho! Let’s go!”) at the same time. * The entire experience takes around 15 minutes, including the 4-minute pre-show. If you arrive early, you’ll spend some more time standing in the outdoor pre-show pavilion. But it’s a very pleasant wait, with much eye candy and Tiki tunes to help you escape to another world. A view of the A-frame ceiling and Tiki architecture inside the attraction (November 2011). * Try not to be the first to enter the pre-show. You’ll be close to the entrance door but you won’t have a center view of Clyde and Claude’s emergence from the waterfall. * The best seats to admire the full “Tikiness” of the room’s A-frame roof and architecture are in the first section to the right. The best spot to hear the full impact of the new sound system is reportedly beneath the baskets of singing flowers. 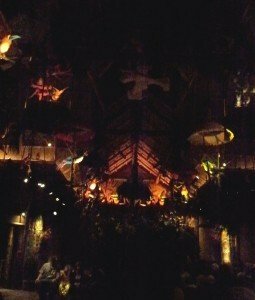 * The Tiki Room is rarely open at night, so be sure to make time to enjoy it during the day. 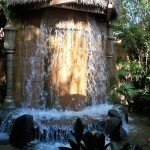 It makes for a nice air-conditioned respite from the heat during Orlando’s many warm months, and a great place to relax and forget you’re in a crowded theme park (except for the crying baby next to you!). * Though it may not be open, don’t pass up the opportunity to walk by and admire the attraction after dark. Like the rest of Adventureland, it takes on a surreal and mysterious vibe when the moon is up and all the torches are lit. The Enchanted Tiki Room’s Under New Management theming (bottom photo, February 2009) was ditched in 2011 when the attraction was returned to its original splendor and re-opened as Walt Disney World’s Enchanted Tiki Room (top photo, October 2011). 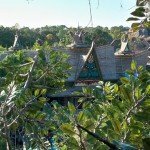 A bird’s-eye view of Walt Disney World’s Enchanted Tiki Room from atop the Swiss Family Treehouse in Adventureland (November 2011). The Enchanted Tiki Room’s roof features Asian water buffalo that appear to be Western longhorn if viewed from the rear in neighboring Frontierland (November 2011). A cascading fountain greets guests in the pre-show area of Walt Disney World’s Enchanted Tiki Room (November 2011). The toucans Claude and Clyde emerge from the waterfall to serenade the waiting guests (October 2011). Claude and Clyde work the crowd. (November 2011). Claude and Clyde’s fountain is surrounded by authentic Tikis and foliage (November 2011). A close-up of some of the artwork in the showroom (November 2011). 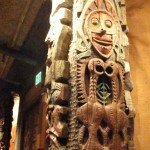 Some of the talking Tikis in Walt Disney World’s Enchanted Tiki Room (November 2011). Pierre and his Audio-Animatronic parrot pals perform high above the crowd (October 2011). 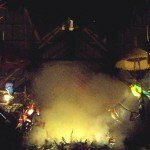 Smoke rises from the planter in the center of the room during Walt Disney World’s Enchanted Tiki Room show (November 2011). Hurricane Hayward outside the attraction, one of only two in Disney World to include the company founder’s name (November 2011). 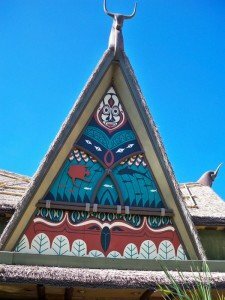 This entry was posted in Art, Attractions, Culture, Disney World, History, History, Magic Kingdom and tagged Adventureland, Audio-Animatronics, Disneyland, Enchanted Tiki Room, Imagineers, Magic Kingdom, Modern Retro Disney World, Tiki, Tiki Room, Walt Disney, Walt Disney World. Bookmark the permalink. 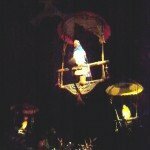 It was my pleasure as a Disney Ride and Show Technician to lead my fellow technicians on this restoration project. I am so pleased you like how it turned out. The technicians did a great job on this project, for sure. It looks to be in great shape for another 20 years at least. Now, how about that Carousel of Progress? 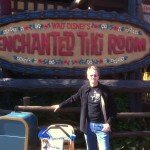 Well I have loved The Carousel Of Progress since the first time I saw it as a little boy in 1976… Unfortunately I work on “The West Side” of The Magic Kingdom which is Main Street, Adventureland and Frontierland. 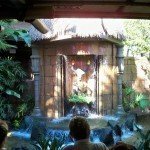 I must confess my heart is in Adventureland… My Disney Career started there as a Jungle Cruise Skipper in 1984. Sounds like a dream job! You’ll be happy to know that we’ll be returning to Adventureland as we continue through the Top 12 “modern retro” Disney World features. Thanks for reading.